​Dr. 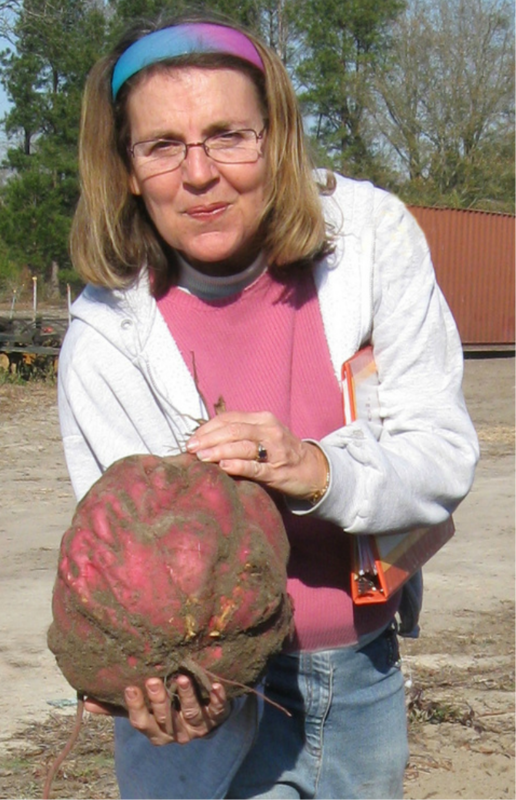 Janice Ryan-Bohac is a leading authority in breeding edible sweetpotatoes for resistance to pests, sustainability, and value-added products like chips, fries, and food ingredients like starch and protein powders. She has also successfully developed new industrial-type of varieties with high yield and carbohydrates. She has released over a dozen sweetpotato varieties and breeding lines with multiple resistance to 14 insects, diseases, and nematodes and developed many breeding lines with high dry matter and high yields for renewable energy and green chemicals. Dr. Ryan-Bohac has authored or ​co-authored several publications and articles on genetics and breeding. Currently she is developing the ENERGY TUBER or eTuber, a very high yielding, heat tolerant, water-efficient crop for fuel ethanol, ‘drop-in-fuels’ and other industrial green products. ​CX-1, the first variety developed as a high yielding ENERGY TUBER, is protected under a US Patent issued in October of 2016. She is conducting field trials in several states and is optimizing the growing protocols and processing methods to maximize crop production. ​​The CAREnergy research farm is in upper Colleton County in the heart of the agricultural production area of South Carolina. It is located in the warm climate and sandy soils of the Eastern US coastal plain area which stretches from southern NJ, through the midAtlantic states, eastern NC, SC, GA, and much of the state of Florida. These conditions are ideal for our ENERGY TUBER. After 9/11, Dr. Ryan-Bohac, like many Americans, decided that this was the ‘wake-up’ call to end the US dependency on Middle Eastern Oil. Further motivation was the clarion call to stop Climate Change with talks by Dr. James Hansen of NASA, the release of ‘An Inconvenient Truth’ by VP Al Gore, and ‘Energy Victory’ by Dr. Zubin, NASA consultant. In order to focus on the renewable energy, she decided to retire from USDA. She purchase her own agricultural research breeding farm to pursue the development of high yielding, sustainable feedstock that can produce cheap sugar and starch. ​This crop is easily converted to fuel ethanol and other ‘drop-in’ fuels using robust, proven, affordable technology.